Toyota has been manufacturing trucks for more than 80 years. The culmination of all that experience is the 2017 Toyota Tundra. 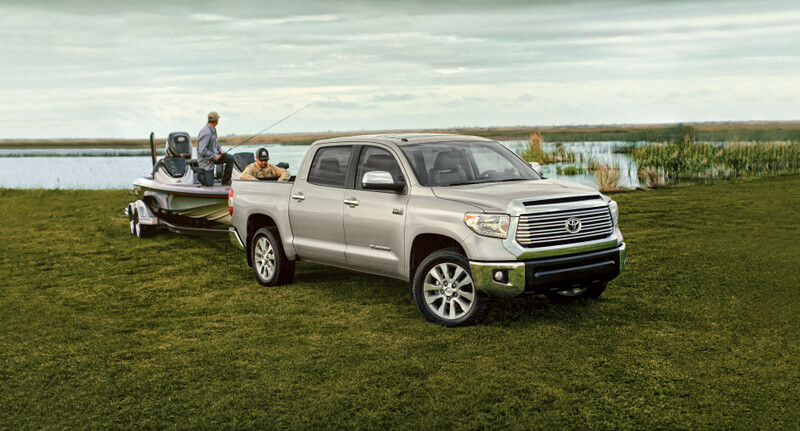 The latest model of the Toyota Tundra demonstrates Toyota’s skill through its spacious interior, beautiful exterior, and powerful performance from its 4.6-liter aluminum 32-valve DOHC i-FORCE V8 engine, capable of producing up to 310 horsepower. The 2017 Toyota Tundra comes available as a 4×2 or 4×4 in six trim levels: SR, SR5, Limited, Platinum, 1794 Edition, and TRD Pro. The SR, SR5, and Limited also comes available with Regular, Double, and CrewMax cab options (standard on Platinum, 1794 Edition, and TRD Pro), as well as Standard and Long bed sizes. For 80 years Toyota has been making trucks, and for 80 years it has constantly improved upon what has come before. 2017 is no different, as the 2017 Toyota Tundra not only continues the legacy of Toyota trucks, but adds to that extensive and impressive legacy as well. * 2017 EPA-estimated city/highway mileage. Actual mileage will vary.